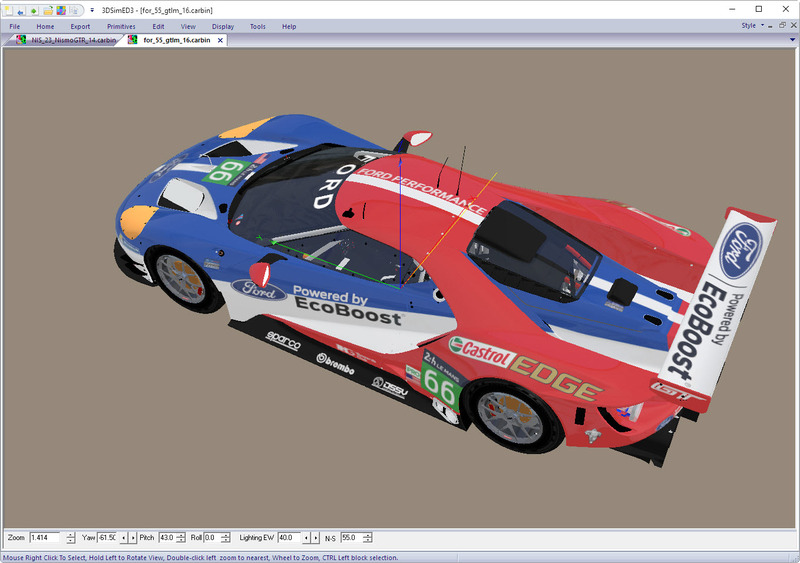 Studio 397 have made some great improvements to rF2 particularly by adding DX11 rendering. A number of new & updated shaders to take advantage of DX11 features have been included, and as a result 3DSimED has been extended to support these enhancements. 3DSimED 3.1m includes the new shaders from rF2 v1109 in the Select DirectX Shader window. This allows materials to be assigned these shaders and saved when exported to one of the .GMT format 3DSimED supports. If the game does not include the material shader then it will just use a default shader (which appears to be the simple diffuse texture map). One of the filters for the shaders in the Select window is ‘rF2 DX11’ which are for shaders included in rF2 DX11 but not in the DX9 version. 3DSimED can include these shaders in the models, and can export them in the .GMT materials, but cannot render them correctly because of the DX11 features used, so it just renders them with a simple diffuse texture. 3DSiimED now includes 3 ‘Decal’ shaders included to make it easier to work with some models from other games. The Download Page includes a .zip of files required to ensure rF2 can understand and render these shaders, just ensure these are placed in the same folder as the CoreShaders.mas. This is an update to the F1-2017 Import plugin included with 3DSimED 31k – it will not work with versions before 3DSimED 31j. Opening some tracks could cause the plugin to terminate. The classic cars were not using the classic tire objects and textures. The higher resolution texture maps (mipmaps) were not used if the original DDS was in DXT1 format. 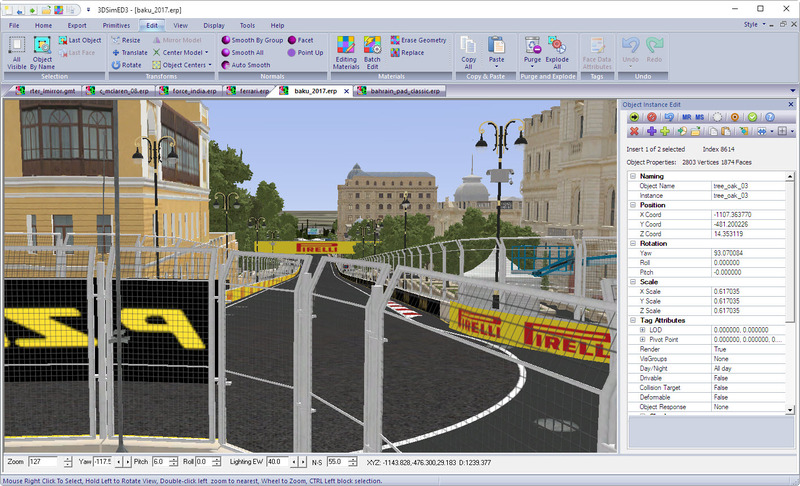 Version 3.1k 3DSimED and later can import models from F1 2017. To import F1 2017 models F1-2017 (*.erp) must be selected as the import file type. Importing Cars. To import a car you must browse to your F1 2017 game and look for the f1_2017_vehicle_package folder within the asset_groups folder. Inside the f1_2017_vehicle_package folder there is the teams folder with all the cars, select the car, and then the wep folder. The wep folder should have the car’s erp file to select and import. Note: to import a classic car browse the f1_classic_02_vehicle_package folder. Importing Tracks. Within the game’s asset_groups folder find the environment_package folder and then the tracks folder. Select the track and find the wep folder. For each track there are two erp to select from, one named <track_name>_2017.erp and the other named <track_name>_classic.erp, select one of those and the track should be imported. Fix: F1 2017 plugin incorrect right front, right back car tires. New: Cars and tracks can be imported from F1 2017. 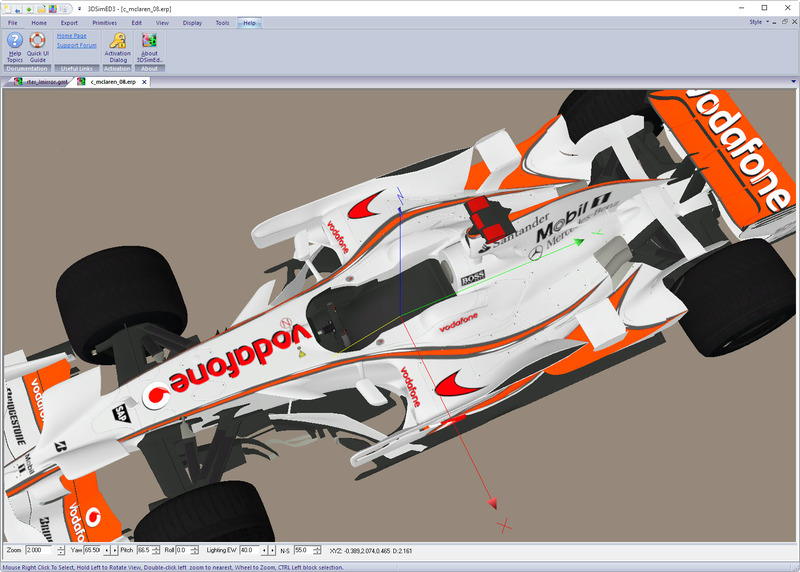 Enhanced: Exporting to NR2003 has been optimised to reduce the vertex count. Fix: Animation types incorrect order in the Edit Material pane. Fix: Export of rF2 mirror materials. This is an update to the Forza Apex/FH3 Import plugin included with 3DSimED 31j – it will not work with earlier versions of 3DSimED. Objects with identical titles but different disk files would load incorrectly. Importing a modelbin with all LOD would fail. Sub-meshes instanced more than once could be scaled incorrectly. Go to the Download 3DSimED page. New: 3DSimED Materials can reference texture maps not used by the Material’s Shader this allows extra texture maps to be imported and exported. New: Export FBX will reference specular, bump, ambient, opacity and cube maps allowing the maps to be imported to 3DS Max. New: Export Collada has option to copy textures to the same folder as the exported .DAE. Spaces in the texture filenames are converted to underlines to ensure the names match those in the Collada DAE. New: Export FBX includes option to copy textures to the same folder as the FBX. The full path to the textures still has to be included in the texture names to ensure that 3DS Max can import the textures. New: Texture Map conversions now has the option to remove trailing GUID strings from texture maps names (this is particularly for Forza import because the swatchbin filenames often include a long GUID string). Enhanced: Forza Apex/FH3 The use of ‘#’ has been removed from imported materials and texture map names. Enhanced: Forza Apex/FH3 The positioning of wheels, rotors and calipers improved. Enhanced: Forza Apex/FH3 LOD handling improved. Enhanced: Forza Apex/FH3 LOD revised material detection, resulting in higher material resolution. Enhanced: Tools->Split Objects The objects created are smaller with less vertices. Enhanced: Tools->Texture Browser->Batch Convert. The limit on the number of files that could be selected has been increased. Enhanced: The Material Edit Pane shows textures missing for the material shader with a magenta border. Fix: Primitives->Add TSO could fail to find texture maps referenced by the object. Fix: JPEG grey-scale images were incorrectly decoded. Fix: JPEG files could not be converted inside the Texture Map Browser. Fix: PNG files written by 3DSimED had reversed red and blue. Fix: Some cars imported from Forza Apex and FH3 could have zero sized tires and wheels. Fix: Dialog windows with multiple floating point input windows could corrupt the values if one of the inputs was negative. Fix: Assetto Corsa fix for ksMultilayer_fresnel_nm shader MultA variable. 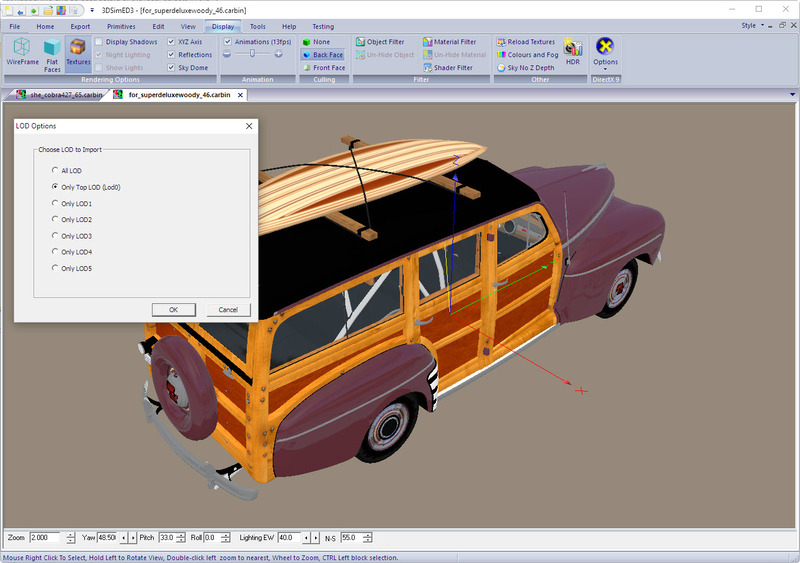 Version 3.1h of 3DSimED can import car models from both carbin and modelbin formats. 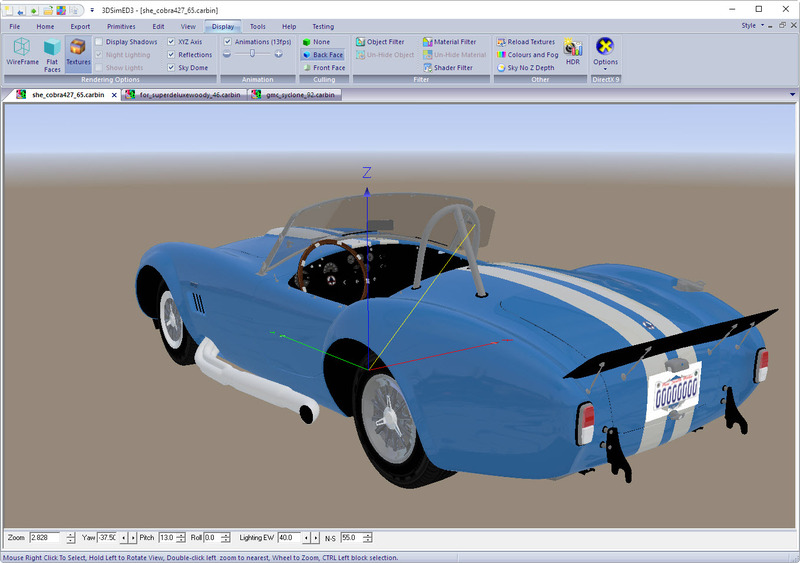 Before importing is is very important to have decompressed the .zip archives which store the resources for the car models. The quickbms program does a wonderful job of extracting the files but, there is a problem. When used to process a folder tree of .zip files, the folder tree created by quickbms is not correct. The simplest option is to use the batch file unzipCars.bat. This batch file skips the tracks which, at present, cannot be imported with 3DSimED. Open the batch file in an editor such as Notepad and change the source (game folder ) and destination folders so they are correct for your system (in Notepad you would use the Edit->Replace function). If you cannot find the source folder you should make sure that hidden files are switched on in Explorer and then look for the WindowApp folder either in C:\Program Files\ or the root of the drive on which Apex was installed. In Explorer, with the shift key held down, right click on the WindowApp folder and open an Admin Command Prompt. From that command window you should be able to see the full folder name for the Forza Apex installation. The second batch file, unzip.bat will decompress the cars and tracks. The Powershell script will generate a batch file, this is useful when the Forza Apex content has changed or to unzip another set of .zip files such as those from another Forza title. At the time of writing, the permissions to execute a Powershell script are switched off by default in Windows 10. A quick search will reveal how to enable permissions . 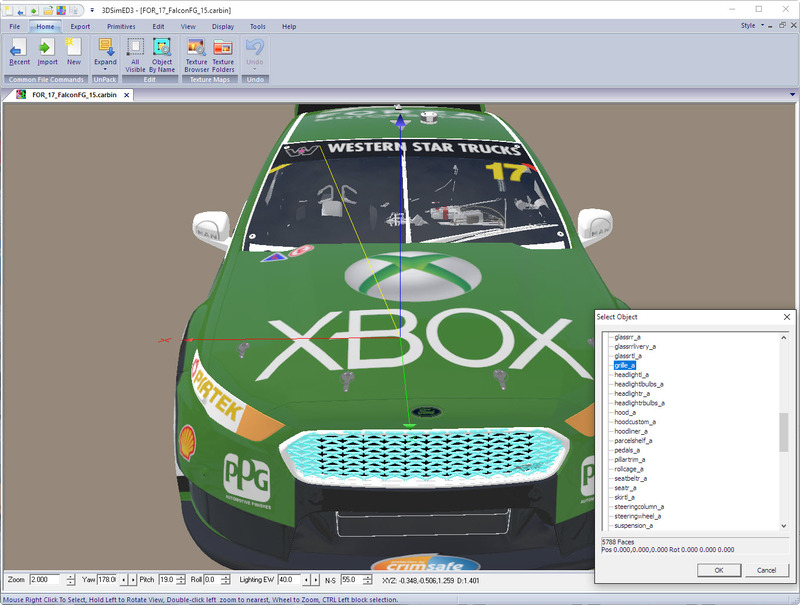 With the Forza Apex resources decompressed and in the correct folders it should then be possible to import .carbin and .modelbin. The .carbin files define a car while the .modelbin files are the components of the car. The .carbin files contain addition material definitions so even when editing a single component for a better result open the .carbin and then isolate the object to edit it. Many materials in Forza Apex appear to use procedural shaders and do not have diffuse texture maps. To help with compatibility with other sim formats, solid color texture maps are created as the diffuse texture maps, for example, rgba#020202ff.dds. Forza Horizon 3 files from a dump can be unzipped easily because there is no encryption but the filenames look very strange. A Powershell script and example batch file can be downloaded here UnzipFH3.zip , the script and batch file use 7-zip to unzip. After unzipping the files will need a renaming utility to process the filenames and when finished the layout and names should resemble those from an unzipped Forza Apex. The files from a car folder are not enough to correctly import a .carbin. 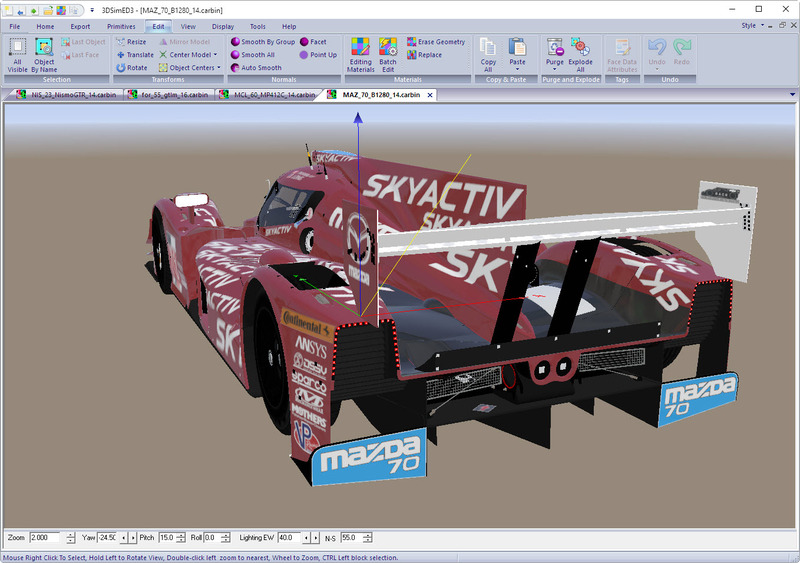 Many of the materials (.materialbin) and texture maps (.swatchbin) are located in the cars\_library folder tree. Version 3.1i includes improved support for rF2, and adds Forza Horizon 3 Import. Studio 397 have included a few new shaders in their release of rF2. These shaders are now supported by 3DSimED3 it should be possible to export models using these shaders. However, please understand that as 3DSimED3 remains a D3D9 application you will not see the same quality rendering in 3DSimED as in the DX11 rF2. Version 3.1h is released with support added for Forza Apex car import. 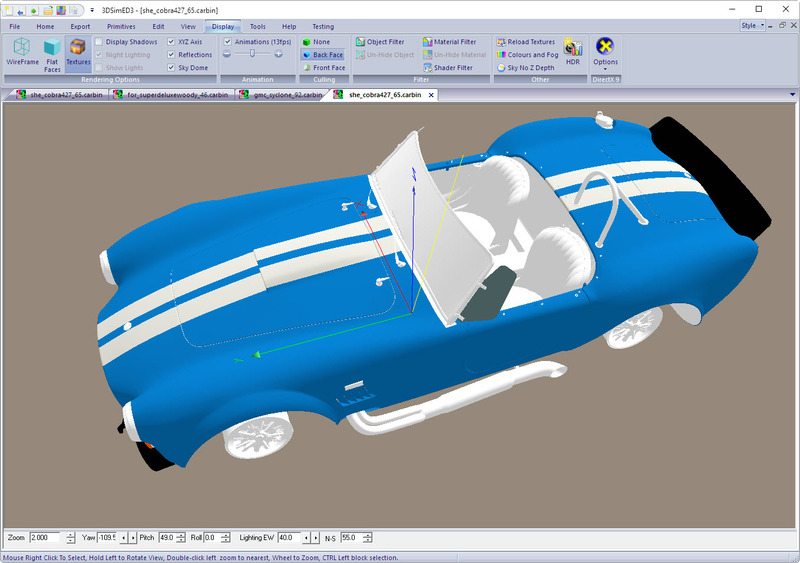 Complete cars can be imported (.carbin) and individual components (.modelbin). Please note that tracks and track objects cannot be imported. Clone Object has been added to the Object Instance Edit Pane. The rendering of cube map shaders has improved, drag rotating a drawing should be faster, Import Collada DAE support is better and more Forza Apex SwatchBin formats are supported. Windows 10 users have had problems on AMD graphics hardware due to changes made in the Windows driver, 3DSimED now has less screen tearing than before. There are also fixes for exporting to PNG, corrections have been made to the order of the SearchPaths in scenes and to the bone positions in an rF2 .GMT when a pivot point has been set.